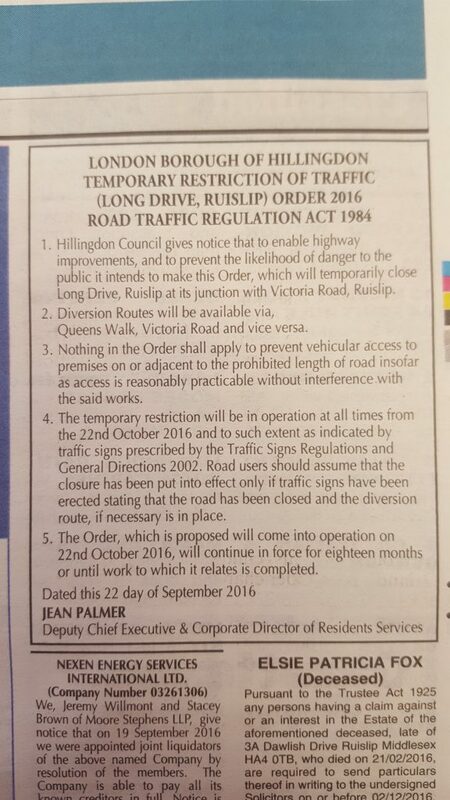 Did you see the Gazette with the planning notice for 18 months at Long Drive / Victoria Road? That will be interesting…. We have phoned the council today and asked them to clarify further details – what the timescale will be and is this ARLA or HS2 related (assume ARLA), what works are being done and have also asked South Ruislip Cllr Allan Kauffman for any information on this one. Will post more when we learn more from them. Spoke to an officer from LB Hillingdon who was good enough to give us an update. The works are for and as a result of the ARLA site, but basically the Traffic Lights and islands at the junction of Victoria Road and Long Drive aren’t up to the job so are going to be replaced. This won’t come as a shock to many of us. It’s going to be quicker and less painful in the long term to do the work over the half term than mess around with temporary lights. LBH want to cover themselves in case the work over runs hence the fairly standard request for access for 18 months rather than the week possibly required. TFL are concerned that it will run into a second week so that remains a distinct possibility. The lights are the responsibility of TLF (Hillingdon don’t control any lights themselves). I asked whether they would be ‘intelligent lights’. The officer said that they would be an improvement especially in the information that they can send and receive back from TFL. But I would add you can only funnel as much traffic into Long Drive/Station Approach as it will take. Hope you know a little more about this now.